Isabel Ngan shares her final project with the class. Members of Northwestern's inaugural "Designing Your Life" course. Angela Hosbein presents her final project to the class. Dave Evans (left) and Bill Burnett visit Northwestern's class for a guest lecture. Yoko Kohmoto presents her final project to the class. Evan Witort (middle) laughs with his classmates. After graduation, Northwestern Engineering senior Angela Hosbein will work at ITW as a product development engineer. But just because she has already accepted a job at the global manufacturing company does not mean she knows how her life will look after June. Although Northwestern students usually feel the most pressure during their job searches, finding a job is just one piece of the puzzle. A new class offered by the Segal Design Institute helps students put the rest of the puzzle together in a way that results in a happy and fulfilling life. Called “Designing Your Life,” the course gives students experience in approaching their lives as a series of design projects. “I feel that one of things that students need to do in college is establish who they are — not just what they do.” — Bruce Ankenman Taught at Northwestern for the first time this year, “Designing Your Life” was inspired by a class by the same name at Stanford University. Through seminar-style discussions, role-playing games, writing assignments, guest speakers, and individual mentoring and coaching, the class teaches students to use design thinking to explore bigger life obstacles, such as finding careers they love and designing a fulfilling life. After Julio M. Ottino, dean of the McCormick School of Engineering, learned about Stanford’s course, he lobbied to bring it to Northwestern. Bruce Ankenman, co-director of the Segal Design Institute and professor of industrial engineering and management sciences, and Pam Daniels, Segal’s design innovator in residence and clinical assistant professor, developed Northwestern’s version of the course. Stanford Professors Dave Evans and Bill Burnett in 2008 launched the course in 2008 because as Burnett put it, “both of us didn’t like the advice we got in college.” Although the pair originally envisioned the course as a way to help their product design students “find jobs,” the class evolved into helping students design the life they want. Now “Designing Your Life” is one of Stanford’s most popular electives and has even turned into a New York Times-bestselling book called Designing Your Life: How to Build a Well-Lived, Joyful Life (Knopf Doubleday 2016). Northwestern’s course has its own spin. Daniels said that a major difference between the two classes is that Stanford’s version tends to abstract the design aspect and focus on the “thinking” aspect, whereas Northwestern emphasizes a more hands-on component involving fieldwork and prototyping. Northwestern will offer its version again in spring quarter 2017. 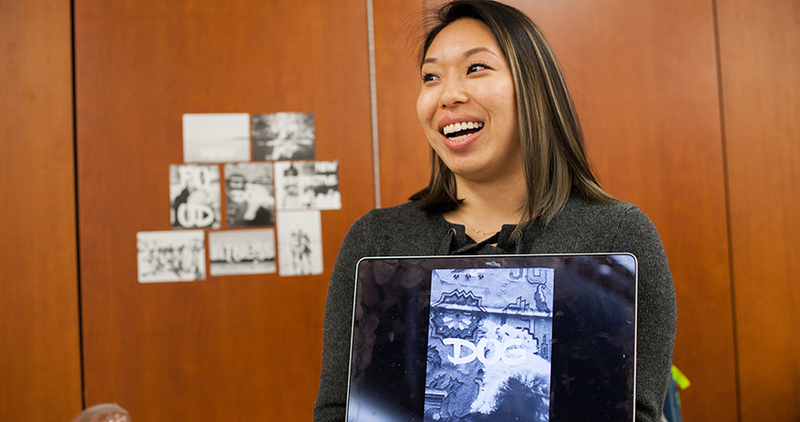 In Northwestern’s fall course, nearly every class period included a quick design project, or “design sprint.” Ankenman and Daniels challenged their students to be active in a studio culture and turn their ideas into tangible outcomes. In one exercise, for example, pairs of students brought photos of their 10-year-old selves to class and described to each other who they were at that stage. Then each person designed something that appealed to their partner’s childhood interests. "Wherever you start is exactly where you are, and there’s nothing wrong with you.” — Dave Evans Ankenman and Daniels said that Stanford was a very supportive partner in sharing their playbook on how they teach the course. In fact, Evans and Burnett visited Northwestern’s class after speaking to a large audience from the stage of the Cadillac Palace Theatre during Chicago Ideas Week, a seven-day festival throughout the city during October 17-23. The Stanford duo guest-lectured on a topic called reframing, a powerful design-innovation tool that emphasizes getting the questions right long before exploring the answers. “What’s the age by which you have to have it all figured out?” Evans asked the students, who quickly called out various ages. Reframing these assumptions made several students experience a wave of relief. Undergraduate Evan Witort, for example, often felt “behind” in Northwestern Engineering’s hyper-competitive environment. “Designing Your Life” has encouraged Witort to throw away the notion that he’s somehow behind and instead rethink what’s possible for his life. In one of the class’s main assignments, Ankenman and Daniels asked students to imagine three possible outcomes for their lives. Witort first jotted down the more expected outcomes: consulting and entrepreneurship. "I’ve stopped looking for just job titles and am more looking for a place with good people whose values align with mine.”’ — Yoko KohmotoWitort partially attributes his inspiration to reframe his thinking to one of the course’s guest speakers: Verinder Syal, an author, entrepreneur, retired business executive, and adjunct lecturer in Northwestern’s Farley Center for Entrepreneurship and Innovation. Witort said the mentoring that the class provided was invaluable. Yoko Kohmoto, a junior studying music in the Bienen School of Music and communication studies in the School of Communications, can relate to Witort’s feelings. She said it’s easy to get so caught up in school pressures that it’s difficult to reflect on what truly makes her happy. Using design thinking caused Kohmoto to look at her life through a fresh lens. Kohmoto particularly valued the course’s “curiosity conversations,” an activity that challenged students to have casual conversations with others out of sheer curiosity. Kohmoto spoke with a Northwestern graduate student and discussed why she pursued graduate school rather than a career directly after undergraduate school. Witort, meanwhile, talked to a cousin who has traveled extensively, visiting six continents. For several students in “Designing Your Life,” the class is the only place where they feel they can openly discuss these curiosities as well as their fears, true interests, and different approaches to life. At the beginning of the quarter, students were organized into small groups, in which they remained for the duration of the course. In addition to the class’s regular meeting time, the small groups met for discussions during a lab section. This was often where the deeper, most fruitful conversations took place. According to co-instructor Ankenman, this class outcome was a success.